Digital transformation has been changing the economy, politics and society for years. Digitalisation has an impact on all sectors and areas of life, offers numerous opportunities and presents citizens, companies and political actors with ever new challenges. 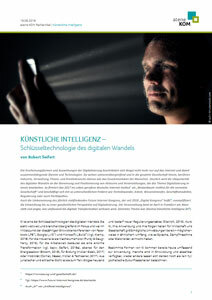 In the specialist dossiers on digitalisation published here, authors from atene KOM deal with the effects and potentials of digital transformation, present developments and solutions. The dossiers are available in German only. Education is a central topic of digital change. It must be rethought in times of new job profiles and digital transformation. Qualification today means integrating ‘the digital’ into knowledge transfer. This creates new opportunities and challenges for the implementation of educational offers. 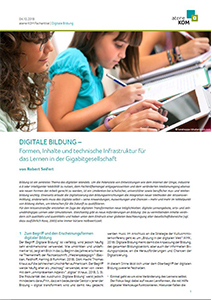 The article sheds light on the term ‘digital education’, deals with different forms of learning and shows how technology and pedagogy must interact in order to make digital educational offers successful, based on the design of funding programmes and concrete educational projects. As key technology of digital change, Artificial Intelligence (AI) is in focus worldwide and across industries. It is a growth engine for industry, an enormous transformation for the world of work, as well as for the energy sector, education and mobility. Certain forms of AI are already being used extensively today, some are in development and will be available in the foreseeable future, others can currently still be described as purely hypothetical future scenarios. The article examines the functionality, forms and typologies of artificial intelligence. It also uses examples to illustrate the potential that the use of AI-based technologies offers for areas that were originally far removed from technology. Agriculture is undergoing a digital upheaval. For some years now, the sector has been repositioning itself in order to meet the challenge of more efficient, sustainable farming with consistently high product quality. AI, big data, automation, new distribution possibilities, the use of weather and geodata – all of these are noticeably changing production and work in fields, pastures and stables. 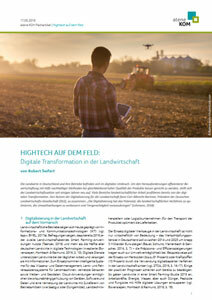 The article discusses examples from the areas of Smart Farming and Precision Farming and highlights solutions and potentials of digital change for agriculture as well as funding opportunities for the sector. As megatrends for society as a whole, digitalisation and globalisation have been changing industry, transport, communications, the economy, consumption and thus the coexistence of all people for several years. The world of work is undergoing a major upheaval. Technical innovations and growing mobility are playing a major role in this. They are changing access to work and thus the population structure in cities and rural areas. The article deals with the changed conditions in the world of work and shows how these are reflected in new working models from which rural areas can also benefit.